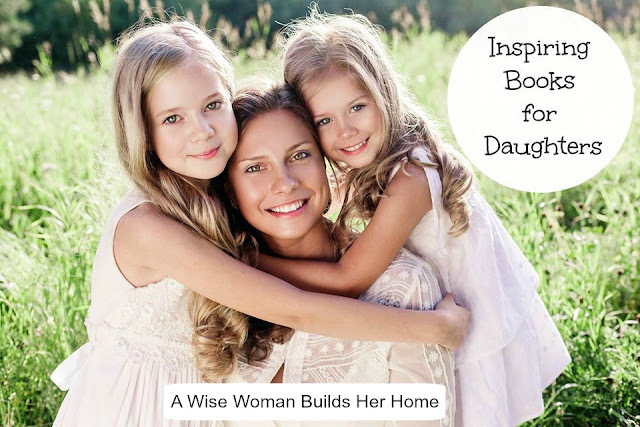 Daughters should be using their time well and reading books is a wonderful way to learn more about character, life, homemaking, etc. But please, don't just give your daughter just any kind of books. Be prayerful and selective about what kinds of books to give them. As a young girl I came across many books that were inappropriate, a waste of time, or just fed the flesh. Books have the power to influence and teach our children for good or evil so be sure of what you are placing in front of them. I make it a habit to always look/read through the books my children read so I know exactly what is being put in front of them. Our daughters and sons are too precious to put just anything before their eyes. We must guide them to use their time wisely and reading good books is a wonderful way to do this while challenging the spirit. Let us all set an appreciation for high standards and quality literature for reading in our homes! Do you have any favorites that you would like to add? Feel free to share them in the comments below! If you are encouraged here, be sure to subscribe and never miss a post! *This post contains affiliate links--thanks for your support! Thanks for this great book list! Our little girls are to young to read themselves but it's never too early for me to read some of those out loud to them! Thank you so much for this list!! I really appreciate it!! do you have any specific ones you would recommend for girls age 6, that are in the beginning stages of reading?? My daughter LOVES the Sarah Maxwell series! I have been concerned about reading material for many many years. One day, when my BIG boys were just little, we were at a neighborhood park and I was talking to a lady friend/aquaintance about books. I told her that I wouldn't read anything that my children couldn't pick up and read what I was reading. She smirked at me and said, "My children couldn't read ANYTHING that I read!" That made a huge impact on me because I didn't want to be that kind of a mother! Thanks for the reading list, I will have to get some more of them for you younger daughter! Thank-you so much for this book list! I very much agree that we should be careful in what they read...My oldest is 11 and she loves to read and I have had to say no to many books already! For teens I would also recommend Jane Austen, especially Pride & Prejudice, Sense & Sensibility, and Persuasion. They extol the virtues of marriage, the virtues of responsibility, and what happens when one violates those rules. I also found Uncle Tom's Cabin to be one of the most beautifully Christian books I've ever read. I've never, in fact, read a better presentation of the gospel than in that book. My girls also loved the Anne of Green Gables series. Once they're teens, too, Brock & Bodie Thoene's stories of Israel and World War II are wonderful--if a little bit heartbreaking. For little girls, one of the BEST read alouds is Treasures of the Snow by Patricia St. John. Great gospel presentation. These are just a few that we've used through the years. My 7yod particularly likes these books. They've been read so much I think I am going to have to replace them before my two baby girls get there. Doorpost's "Polished Cornerstones" may have more suggestions. I think they just revised this book. In fact, this book can also be used with young girls. I use it sometimes with my 7 yod and have with my 11 yod. I have the older version. Sorry to post again. I wanted to add that this website has some great books for the little girls. I was just on there and saw several new books that I will be adding to our list. As a teen I loved reading the Love Comes Softly Series by Jannete Oke. She is an amazing christian author. I would recommend her to anyone. BTW her other books are equally as good. This is a great list. I would add that if you disagree with feminism then the Little House books have some of it in spots. Like when Laura is marrying Almanzo she refuses to say "obey" in her wedding vows. I know outside of the Bible we are going to find flaws in different writings, our family tries to use those opportunities to teach a biblical worldview vs. an unbiblical worldview. It's so important to draw attention to reading, and attract reluctant readers to it, especially boys. In fact, I've recently completed a feature magazine article on this subject that came out in October, "Help for Struggling, Reluctant Readers." My blog, Books for Boys http://booksandboys.blogspot.com is dedicated to drawing attention to the importance of reading. And my new book, Lost Island Smugglers - first in the Sam Cooper Adventure Series - is coming out in July-August. Contracts are also signed for Captain Jack's Treasure and River Rampage. Thank you very much. I am a 13 year old girl who LOVES to read and write, and I am ALWAYS looking for good books to read that will help me with godly character and keep my mind pure. I do have a question though, what do you think of the 'dragon's in our midst' series. I personally have no intention of reading them, though they are suppose to be christian books, I have learned to be very careful with fantasy. However, some of my friends say they are really good, and tells me I should read them. I am trying to tell her very kindly that I don't want to read them, but she keeps asking why I don't. I can't really think of a good way to tell her, and as I know little about the series except that it does have some objectionable things in it (like magic) I don't really know how best to answer her. my email is grace96glory@gmail.com please help. I was always a lover of fiction as a young girl, and would read other more instructional books, but fiction was truly what I craved. For fantasy, nothing can be more divine (literally!) than CS Lewis and JRR Tolkien. Some girls, like myself, quite enjoyed adventure stories. I find that to still be true with my own nieces. Anne of Green Gables is just lovely! I still read and re-read those books. Also, although perhaps with some doubtful parts, I loved Little Women. A Secret Garden is always a favorite, as is a Little Princess. And the oddest thing? I loved reading etiquette books! Miss Manners has modernized herself too much, but Emily Post is still grand. I've been trying to find good books for my 7 year old. She reads at a grade 3 level. She is using the Rod and Staff readers and we found the Rachel Yoder series which she is enjoying, but I'd love to find more that are for her age/reading level. Jenette Oake is a Christian author. She has both Christian adult fiction and children's books. Below is a list of her children's books. I believe Maxx Lucado had some very good children's books with a message. "One of the key questions on parents' minds these days is whether they have to worry about the content of their early readers' books. With Janette Oke's Animal Friends, those worries disappear. These are titles suitable for all young children that teach valuable lessons and do it in a fun, safe way. Colorful and featuring charming illustrations, each title features a precocious animal who uncovers important instruction on growing up—whether learning the value of family, the reasons to obey, or the importance of being yourself. The easy-to-read chapters also make the books invaluable tools for teaching little ones to read. For ages 6 - 10." I'm going to be sure to write this list down as I have an eighteen month old daughter (after five boys!) and I've been looking for good books to begin collecting for her. I agree with what another commenter said about feminism in the "Little House" series, particularly if I remember correctly in "These Happy Golden Years." The tone of this book isn't like any of the other "Little House" books. After I read it I thought it was very interesting that Laura is somewhat of a feminist and it is obvious that she doesn't exactly have the highest respect for Almonzo. She doesn't seem nearly as happy as in the other books where she speaks so highly of her mother and the respect she (Carolyn) has for her father. It's interesting that she didn't figure out the correlation between the respect and happiness of her mother toward her father and her own unhappiness and disdain toward her husband. (I know many of us including myself are just like that!) Anyway, I'd like to add some books to the list, but for boys. My absolute favorite is the "Little Britches" series by Ralph Moody. This is like "Little House" for boys and is a true story in about the same time frame as "Little House." Honestly I can't fiure out why it's not as popular, as my sons think it's even better than the "Little House" series ;D My sons (three teenagers now) have been so inspired by Ralph Moody's hard work. To this day, while I have tried to instill a hard work ethic in them (I hate that I'm naturally lazy myself!) I credit many of the compliments they receive for being hard workers to having read this series. And if you want to know what a super-hardworking woman looks like (not to mention extremely reverent) look no farther than Ralph Moody's mother. We read this series several years ago and to this day, when I'm tempted to take the lazy route or be disrespectful to my husband when I don't agree with him, I think of Mary Emma and change my tune...I can't say enough about her. We didn't read the whole series, just Little Britches, Man of the family (you HAVE to read this one! ), The Home Ranch Mary Emma and Company, and Fields of Home. A word of caution: A very few time Ralph Moody quotes word for word what someone says and sometimes it is a borderline curse word. Anyway, "Sign of the Beaver" is another excellent one, and The Sugar Creek gang is a pretty good series for elementary/middle school with lots of references to God. This is in response to cuppycake: "I can't really think of a good way to tell her, and as I know little about the series except that it does have some objectionable things in it (like magic) I don't really know how best to answer her" Many Christians would be surprised at me saying that I have never allowed my children to read Tolkein's "Hobbit/Lord of the Rings" series or CS Lewis's Chronicles of Narnia. I loved these both as a child myself, but as I began to read the Chronicles of Narnia when my children were very young and would get to a part about the "good magic" and casting a "good spell" and a "good witch," my husband who never read this series would yell from the other room, "What are you reading to the kids?!" I would respond, "It's ok, honey. This book is talking about 'good magic/spells/witches'"...silence...Then my young son would say, "Oh! I see! There's good magic and bad nagic." He said this two more times about the spells and witches part. Each time I would respond (with my husband quietly and attentively listening from the other room), "No, there's no such thing as good magic/spells/witches. "...more silence...I then realized how crafty Satan can be. He candy-coats things because he knows if he presents them in their true light, we wouldn't accept them. When we want to feed some of that ill-tasting baby food to our young child, and they won't accept it, what do we usually do? We dip it in the "Pineapple Delight" and they readily devour it! I'm not saying CS Lewis or Tolkein weren't good Christians and didn't have amazing insight, but God's word condems magic as well as other sins. There is no such thing as good magic just as there is no such thing as good adultry. Personally, I know there are some amazing spiritual insights that can be gleened from both of these authors, but we have to be careful not to create an appetite for forbidden things just to give them some spiritual insight. As the saying goes, "Christians aren't perfect, just forgiven." This holds true for any Christian- including famous Christian authors such as these. Just because we admire someone doesn't mean everything they do/write is perfectly Godly. As a side note: After reading these books/watching the movie as a young teen and reading other books from non-Christian authors about magic, I began to dabble in the occult. It created a voracious appetite for magic and the like, but thank the Lord, He rescued me just in time, before I got in too deep. I'm not saying this would happen to everyone who reads these books, but it did happen to me. Thanks Dianne. I like the C.S. Lewis books and the Lord of the Rings, but I totally agree that there is some stuff in there that needs correction. (Like Gandalf being a 'good' wizard who can cast 'good' spells. Or even Aragorn having that kind of 'Elvin Magic' that could bring Faramir out of the 'shadow')But I still think they are good books. When I read, I like to play a game where I look for the things that are unbiblical. (an easier exercise for those who are interested in playing this game is 'Family movie night') It's surprisingly easy, even in things bought in the 'christian' book store, like the Dragon books. I am happy to say that while my friend is still into the dark ages theme (and I have to say, all those princesses and knights are interesting) she is moving into more of the brave HUMAN knights and HUMAN princesses. Yeah! Thank you for this list... you have caused me to spend several hours on Amazon updating my "wish list"! Thumbs up! I didn't see it on your list but Fascinating Womanhood by Helen Andelin is an Amazing Book for all Women to read. I really enjoyed looking through this list, and if at some point you have the chance to put together a boys' book list, too, I'd sure appreciate it! Thank you for this list. I am reading one of the Lamplighter series to our children and have bought several of their other books. They are just beautiful and also a rich source of vocabulary! "For teens I would also recommend Jane Austen, especially Pride & Prejudice, Sense & Sensibility, and Persuasion. They extol the virtues of marriage, the virtues of responsibility, and what happens when one violates those rules." I would definetly NOT recommend Jane Austen for teens. Most people believe Jane Austen to be a romance novelist, when in fact she is a satirist who criticizes the society in which she lived and its morals, especially the way in which money and the law put women to a disadvantage. In "Sense and Sensibility" the sisters are left destitute after the death of their father because their brother inherits everything. In "Pride and Prejudice" the sisters will lose their home when their father will die, because according to the law the house will be inherited by their father's male relative, Mr. Collins. Emma does not want to get married and prefers to remain an independant woman until the very end of the novel, when she realizes she loves Mr. Knightley. Lizzy Bennett from "Pride and Prejudice" refuses two advantageous offers because she does not want to marry without love, thereby she disobeys her mother who wants her to get married at all costs. In the same novel, Charlotte marries the disagreeable Mr. Collins whom she dislikes because she does not want to become an old maid. She spends her married life inventing all kinds of tricks just to avoid spending time with her husband. Jane Austen's novels are full of indirect feminism, especially Pride and Prejudice. So I would definitely not recommend Jane Austen to young girl who want to become submissive wives. Beside her Joyce seems innocent as grass. Describe the amorous effects of "brass,"
The economic basis of society." http://www.keepersofthefaith.com/category/ElsieDinsmoreAnEnigma is the information I was referring to, and the issue was actually in book 4. What kinds of books did you consider a waste of time?